Have you ever thought of where the miracles come from? If you pour a drop of water on a bronze piece, would that give you anything special? There is a woman who can turn that mixture into outstanding and mind-blowing masterpieces. Małgorzata Chodakowska was born in Poland in a city of Łódź. Her parents noticed their child's outstanding skills in early childhood, and her destiny was decided. She went in art and devoted her every spare moment to drawing and painting. Although later on she realized she would love to cast her lot with sculpture. Without any hesitation, she entered the Secondary School of Arts in Łódź. There she studied the history of art and finally learned how to turn any material into realistic figures. After her brilliant graduation, she left Poland to continue her study in Austria. She was welcomed by the Academy of Fine Arts Vienna. There her love for the sculpture was revealed to the fullest. World’s best professors and sculptors appreciated Malgorzata’s exceptional skills and talent to make any material look alive. After she met her beloved one and got married in 1991 – Chodakowska moved to Germany. Till now she lives in Dresden and calls herself a free-lance artist. 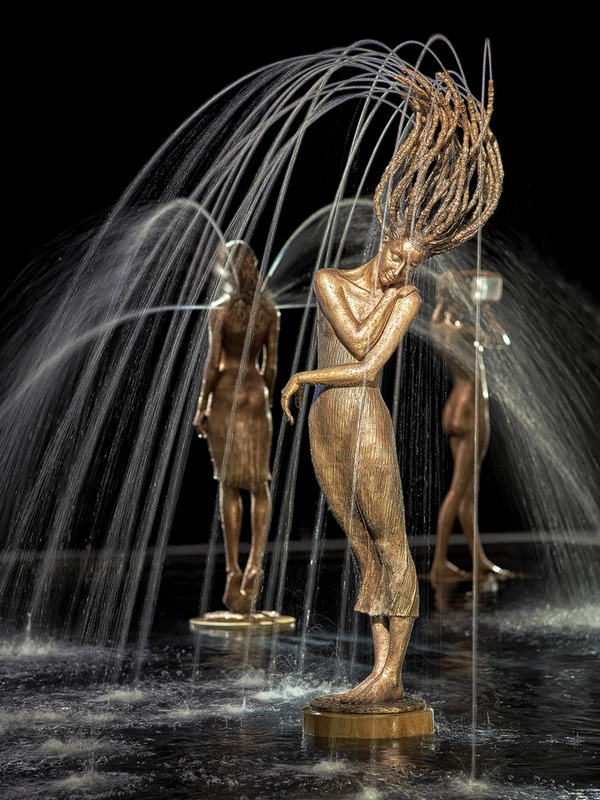 Malgorzata created impressive figures of bronze, steel, and other materials. She used to portray people in action. In her artworks, you can see human beings as if they were captured in the very intimate moment. All their emotions and feelings can be read out of their faces and bodies. All those sculptures show off pure feelings: love, passion, excitement. You always know what is on their mind. In the mid 90's she thought of the fact her works were too static. She wanted to add something special, to make her sculptures stand out. That was the first time the master thought of water. Creating regular fountains were too plain and too boring for Malgorzata. She thought of making water a part of the sculpture. She needed to enlarge her knowledge about the main water properties. What if water could be sculptured as well? Everyone knows about ice figures. But unfortunately, those cannot be kept for long. And Chodakowska discovered a way of sculpting the liquid. 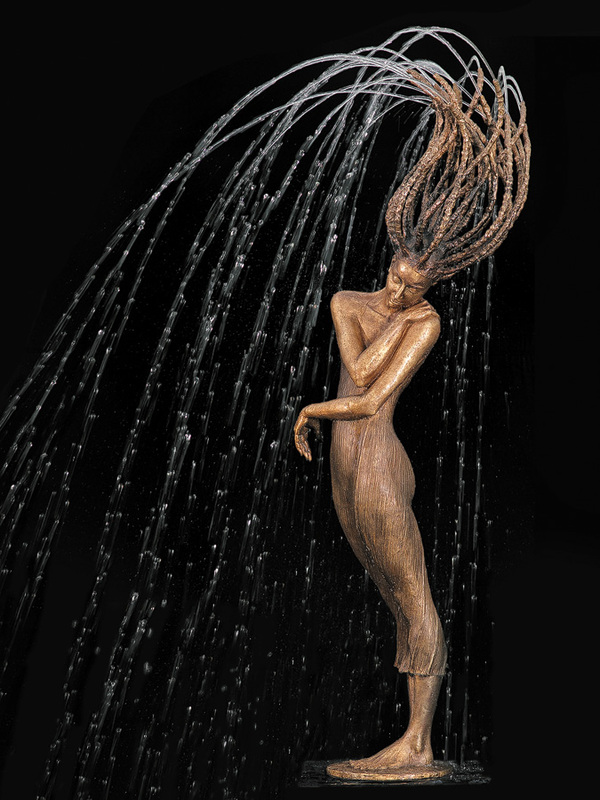 If you take a look at her fountains, first it is hard to say where the sculpture ends up, and the water starts. How come all those ideas popped up in one cute blonde had? Here is her incredible Kleine Ballerina (Little Ballerina) fountain. Its height is 171. A teenage-looking girl is practicing in ballet dancing. She stands on the tips of the toes with her hands above the head. The girl is dressed in a bronze maillot and a ballet skirt. Yes, the ballet skirt is water! Looks incredible, isn’t it? The secret of the fountain is hundreds of tiny holes that make water run that special way shaping up into a nice outfit. 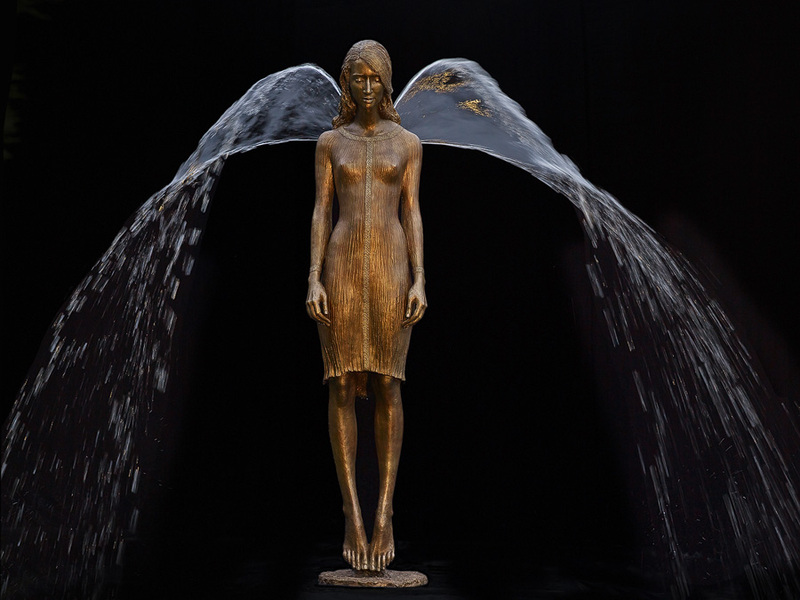 Another fountain, Engel (Angel, 181 cm), hypnotizes the spectators with the two water wings at her back. The way water forms those wings gives us a feeling of hovering. A combination of bronze and water is not something out of this world. But combining them this way is like turning the objects into live beings. Here we come to the 220 cm, Primavera. A naked girl ‘captured’ dancing with her hair spread asides. But how long is that hair? Water dribbles start exactly t her hair ends and fall on the floor. Magnetizing look. They say it was difficult to stop staring at Primavera. All these sculptures have incredibly detailed figures and faces. They look so realistic that can easily be confused with live people in the twilight. The Master says that every fountain is like a child. It takes her some time to create a project in her mind than transfer it to the paper and only after that she starts bringing it to reality. The first step here is making a wooden form. Malgorzata is using oak. After the form is complete, it is covered with bronze. And then the magic starts. It sometimes takes numerous attempts for a sculptor to set her ideas to life. But when she finally succeeds – we see an excellent and perfect figure which, they say, has a soul. Although it takes enormous efforts and a lot of time for creating every item, nothing can stop her. She keeps fulfilling her experience with new masterpieces month by month. Most of the orders she receives are for private collections, but she also was the one who decorated Radeberg Humboldt-Secondary School and civil registry office with her incredible artworks. We can only admire her creativity, strong imagination and outstanding skills and wish Malgorzata inspiration. People like her are called to make our gray and boring world beautiful. Her every work deserves a special award.